East to move all-metal snap-in dividers may be spaced at desired locations along length of shelf in 1-1/2″ increments. 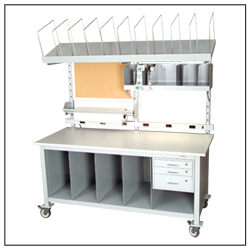 Top front of Dividers and supplied end stops feature radius corners for appearance and safety. Shelf available in full and half table lengths. Mounts to Solid Uprights using Shelf Brackets (both sold separately).